When wifey told me about this song that went viral, I went to take a look at the music video on YouTube. I was amused by the video content, at his silly dance moves, the satirical portrayal of scenes, the funny-sounding lyrics. I thought, like most other silly videos/songs I came across, I would just laugh it off and move on with life, and I actually did. While my wife, upon finish listening the song, proclaimed that she would be unable to get the tune out of her head, I couldn’t recall the tune after I went to bed. A few days later, more people over my circle of social media started mentioning more about the infectious song. A part of me wanted to re-watch the MV, and eventually, I researched about the song, about the singer, watched the “Making Of” video which made me appreciate the music video even more (I always like watching the “Making Of” video in any media production. You learn more from the process than the end-result). This 9gag strip basically explains my experience. So, why do I find it so enticing to listen and watch this infectiously “ridiculous” song? Why is it so catchy and enjoyable in my opinion? Something that funny deserves to be watched over and over again (don’t you enjoy Mr. Bean despite its silliness?). And every time I watch it, I look for new things. Did you spot the underground subway scene where one of the background dancers actually stopped the dance steps before the scene was cut? Or how helpless the 2 dancers were during the snow-blowing scene where the white flakes got stuck on their faces and the director refused to stop the filming? Another familiar trait of the song that makes you groove to your feet. 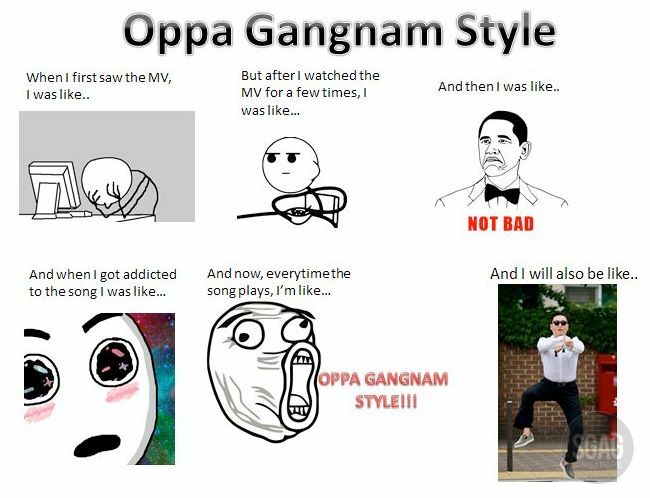 Surely you will not find it hard to say “Oppa Gangnam Style” rhythmically. Why, you don’t even need to pitch and you are performing the song already. The dance steps is short and easy to learn. Left, Right, Left, Left. Right, Left, Right, Right. All this time, cross your wrists and move them in downward beats. After 2 bars, change your hands to do a lasso movement. Despite being in a foreign language, the repetitive and easily-pronounced words make the song easy to sing along. And comes the transition (my favourite). YOU KNOW WHAT I’M SAYIN…!? PSY (Park Jae-Sang) the composer-singer of the song is a graduate from Boston University and Berklee College of Music. His clear pronunciation catches attention with English listeners and makes the song more singable in English (sparing the millions of English-speaking fans having to pronounce the words the way of these foreign singers did just to mimic the actual song). In contrast, the other Korean singer HyunA who sang an alternate version pronounced the word “style” as “stye” without the “l”. Yes, PSY has made his style (and his mark) on the International music arena. Don’t be ashamed to like and enjoy this song in its original flavour. Just DON’T dance it in public. Imagine, would you act like Mr. Bean in public?